I've provided nursing care and EMS services in a lot of different places and in many different settings. I've ridden in the back of a lot of ambulances and cared for patients in a variety of helicopters. I've even raced to the scene of an accident on horseback. But going 'lights and sirens' in a golf cart is a new experience for me. This is the nurse's ambulance parked by my back porch.Can you see the lake in the distance? 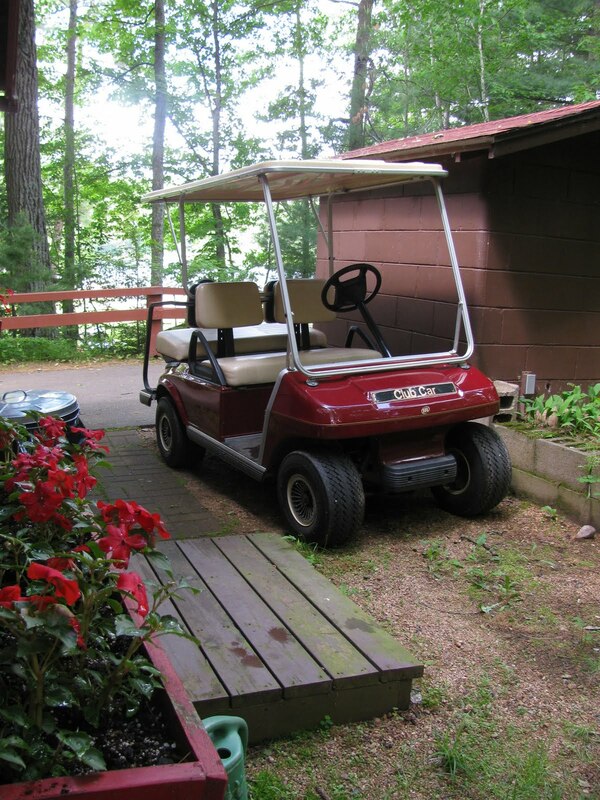 Believe it or not, I've never driven a golf cart before; Connie checked me out in it and I passed with flying colors. I'm amazed at how speedy it is. It definitely gets me places faster than I can walk. It's perfect for the little paved roads and dirt trails that meander around camp. Not that I want anyone to get hurt/sick, but I think driving the golf cart around looks like fun:)! I love it ... by the end of your career, you'll have traveled almost every way possible!